Since it is Earth Day, I thought it would be a great day to tell you about my recent biking adventure. 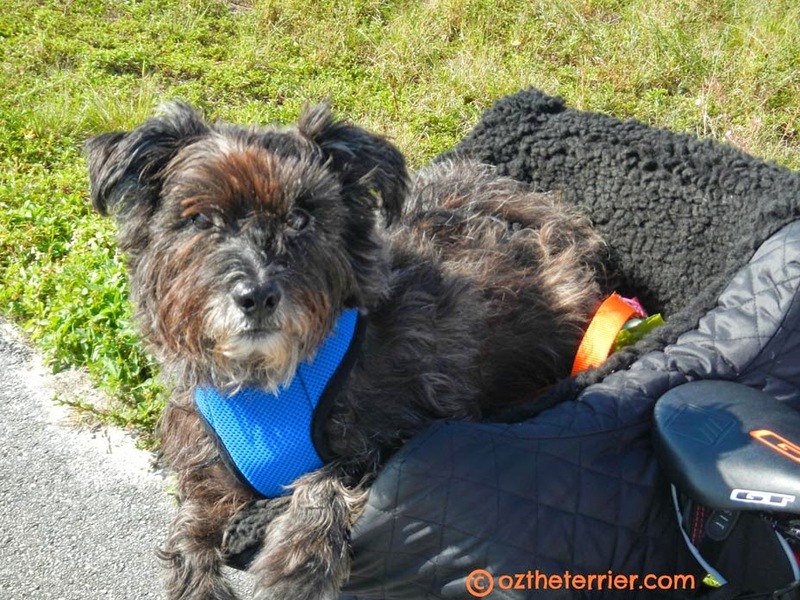 Actually, I should say riding adventure because I just sit in my basket while Ma or Daddy-dog pedals. 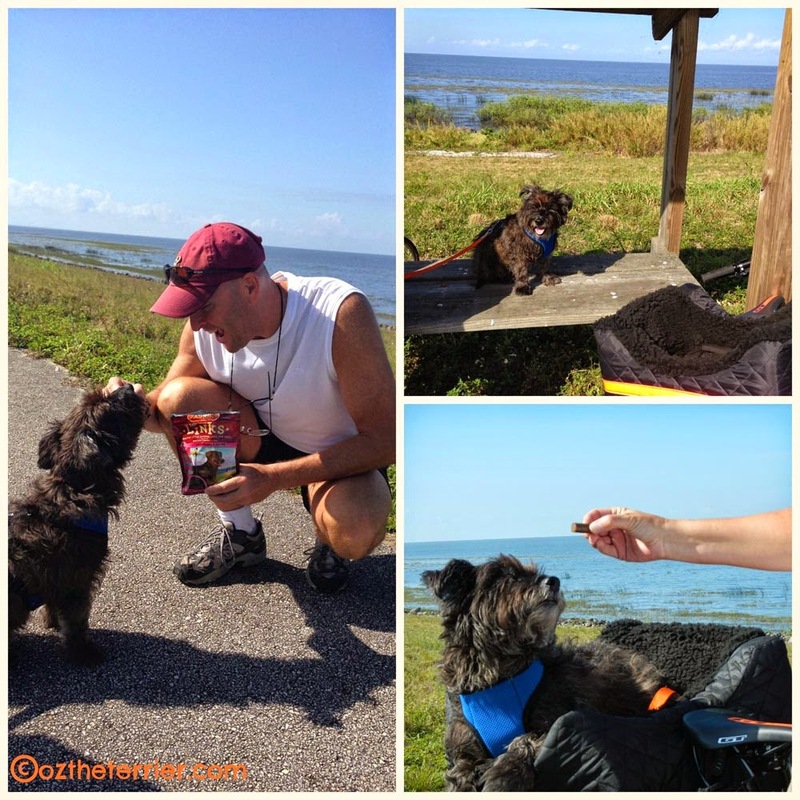 On this trip I went with Ma, Daddy-dog and Uncle Robbie on the LOST Trail (Lake Okeechobee Scenic Trail). 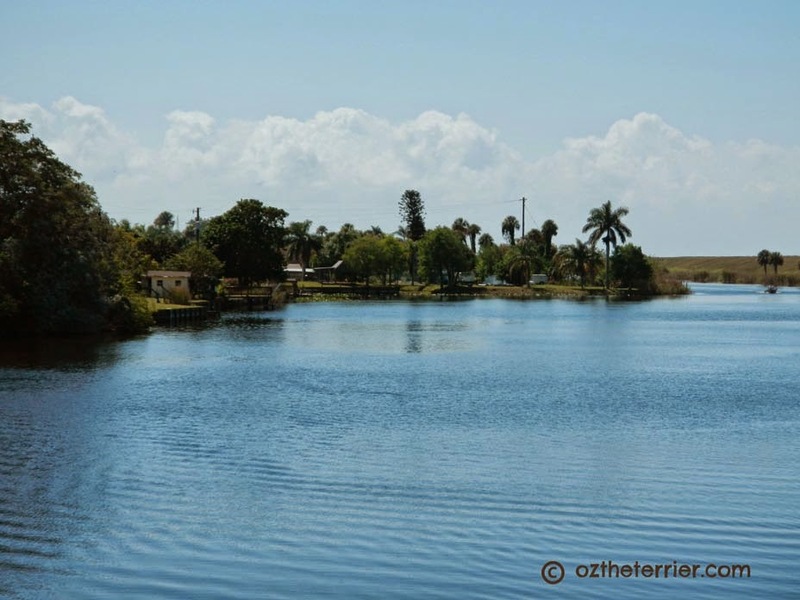 For those of you unfamiliar with South Florida, Lake Okeechobee is Florida's largest lake situated in the middle of five Counties (Palm Beach, Martin, Glades, Okeechobee and Hendry) and it is the second largest body of fresh water in the contiguous United States. The word Okeechobee comes from the Seminole Indians - "oki" (water) and "Chubi" (big) - basically, "big water". Although it has a surface area of 730 square miles, the lake is actually quite shallow with an average depth of 9 feet. Lake Okeechobee and its wetlands are at the center of a much larger watershed, the Greater Everglades, that stretches from the Kissimmee River through the Everglades and into Florida Bay. The lake provides natural habitat for fish, wading birds and other wildlife and supplies both flood control and potable water for much of South Florida. The lake's health was threatened in recent decades by excessive nutrients from agricultural and urban activities in the lake's watershed, by harmful high and low water levels and by the spread of exotic vegetation. The Florida Legislature enacted the 2000 Lake Okeechobee Protection Act and the subsequent Lake Okeechobee Protection Program to restore the lake and its watershed. The Lake Okeechobee Protection Program is designed to restore and protect the lake by improving water quality and implementing long-term solutions through a variety of specific components. 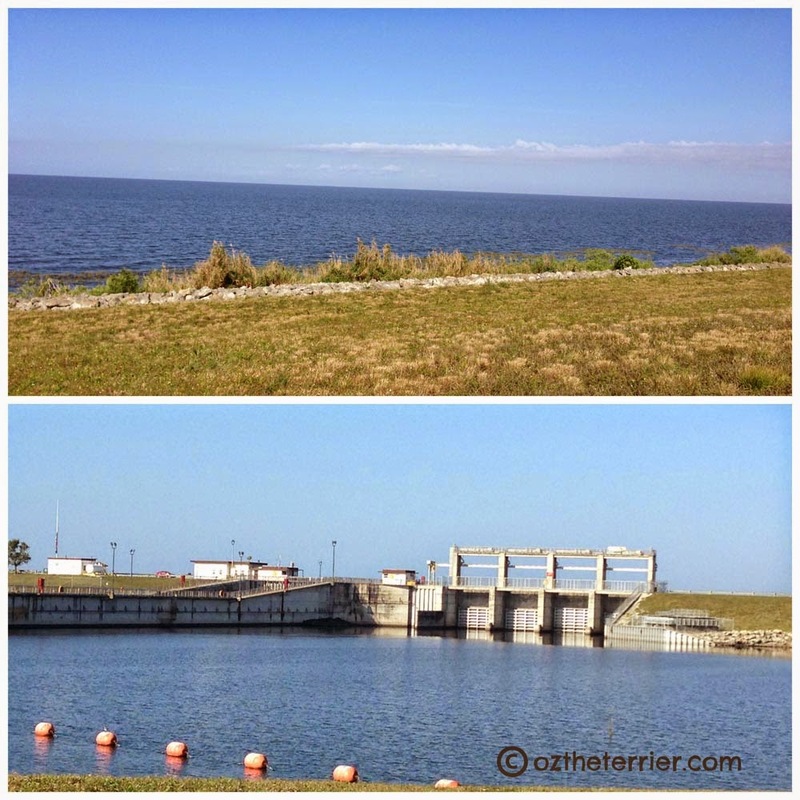 The Lake Okeechobee Scenic Trail is situated atop the Herbert Hoover Dike which surrounds the lake. The dike is built (and maintained by the Army Corps of Engineers) for flood protection, so it offers an elevated, unobstructed view all the way out to the horizon. If you didn't realize that Florida was flat-Flat-FLAT, you will when you are on this trail. From our starting point at Port Mayaca (my-ah-cah), we headed North and rode out and back for a total of 20 miles. On this northern section of the trail, a canal runs along the other side of the dike and people actually have some really cool houses on the "mainland" across the canal. Every few miles along the trail there are little covered benches for taking a rest in whatever bit of shade it can provide. Other than these little benches, there are no trees, no shade and no restrooms on this trail. It is wise to do like we did and pack a small cooler with additional water and some energy snacks (or in my case, some Zuke's Lil' Links - no energy snacks needed for those who do not pedal). Since the LOST is on the elevated dike, there are no cars or anything to worry about when you are riding. Bikers just need to be careful when crossing the locks because you have to squeeze through some gates. All in all, it was a very peaceful, leisurely bike ride to enjoy all the scenery the lake has to offer. 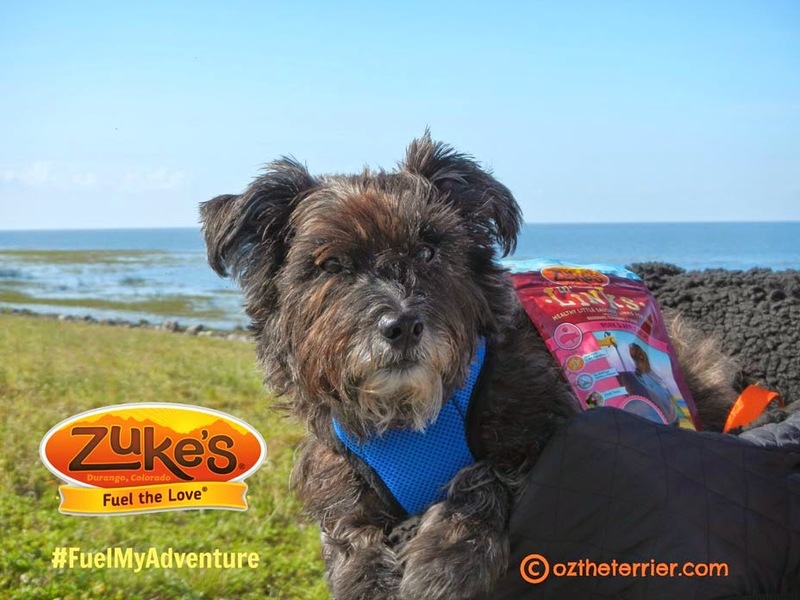 A special thank you to Zuke's, Oz the Terrier Blog Sponsor, for Fueling My Biking Adventure! That's a neat place to bike just so long as you slather on sunscreen! Nice and level biking! Looks like a fabulous place Oz and even better as there are no cars. Have a terrific Tuesday. Weren't you afraid that an Alligator would get you? Wow, you look like you're having so much fun! I love your bike basket. When I first saw this title, I thought that the peeps couldn't find their way (again) and you had to save the day by getting everyone home safely. That looks like a great place. Bike rides are fun. Dogs get to view the scenery, and just relax. That was a fun adventure Oz! My Dad has been to that lake and he says is really is nice. We love, love, love our planet! Happy Earth Day!!! Oz, aren't you afraid that you'll unbalance your human leaning our of your basket like that? Looks like y'all had a really fun time! you always take the BEST adventures and I LOVE when you share info about the great places that you visit! What a cool lake Oz! My family has a lakehouse on a very nice lake called lake Travis here. It's kind of interesting that your lake is so big but not that deep. Lake Travis is 60 feet deep on average. I've heard there are catfish as big as VW bugs near the dam! Great adventure! Looks like you guys had tons of fun!!!! What a beautiful place and a perfect post for Earth Day! What a great adventure. I would love to visit there. What a really cool place and great time you had. Love your basket, are you strapped in there? Enjoyed the pictures. I bet your a great backseat driver. Dat looks like a fun place to go bikin! That looks like tons of fun! Our mom was hoping to get the bikes down and pumped up ready to go again this weekend! What a cool place to ride bikes, it sounds beautiful. What fun for you also, Oz. I would need restrooms though....lol.